It might come as a surprise to some of you that up until very recently (and by recently, I mean this year) I’d never had macaroni cheese. I know, it came as a surprise to me too, I love pasta and I really love cheese. 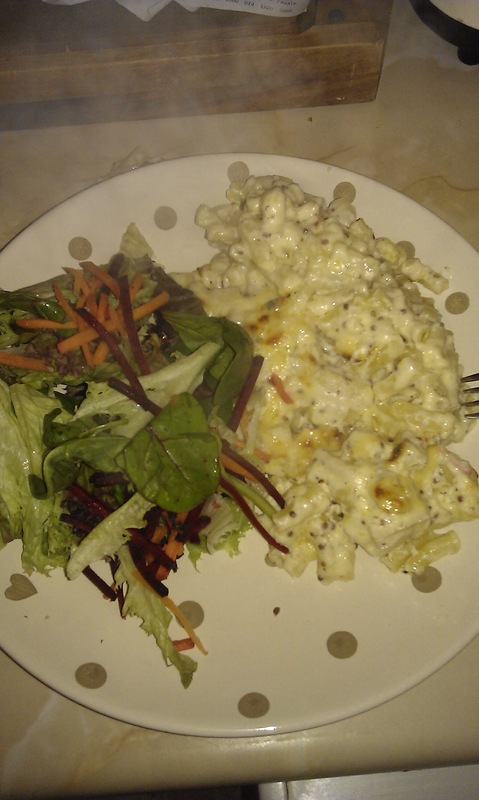 How did I get to the age of 27 without eating macaroni cheese? How could such a thing happen? I wish I could say. Despite my dad hating cheese, I still got a decent amount of cheese on toast and pizza as a child, yet mac and cheese evaded me. As a cookbook obsessed, blogging adult, macaroni cheese was always on my hit list, and with the not so keen on it Boyfriend away in Kenya, now seemed the perfect time to make one from scratch. Being such a classic recipe, there were many cookbooks that I could have got a recipe from but I chose Supper Club by Kerstin Rodgers which hasn’t really been used much at all since I brought it last year. It’s a straightforward recipe where you have to make a cheese sauce (a béchamel sauce with cheese melted into it), boil up some pasta and then combine before popping in the oven. This cheese sauce had the inclusion of whole grain mustard and pickled green peppercorns which I for one was most grateful for. They cut through the richness of the cheese, although not as much as I would have liked. It was a really rich pasta dish and while very tasty, was a bit much. That’s right, it was a bit much for me and I didn’t even have enough cheese as specified in the recipe. 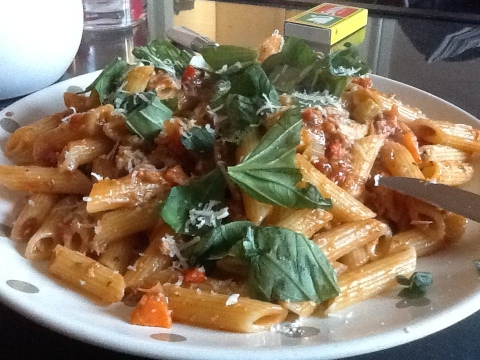 When it comes to pasta, I’m very much on the side of tomato based dishes. I love cheese and cream but given the choice between a carbonara or an arrabiatta, the arrabiatta will win every time. Tastes better, is probably more nutritious and I can easily eat a whole lot more of it than a creamy pasta dish. Winning all round. This then was exactly the kind of dish I craved after waking up on Sunday with the hangover from hell, living room floorboards soaked in 50% vodka and cava, and eggcups coated in pink gunk after being used as makeshift shot glasses. Clearly a good night had been had. What can I say, after years of faithfully relying on cookbooks for culinary inspiration, alcohol gave me a eureka moment and this recipe just popped into my head. I just don’t do my own recipes normally so this really was a bolt out of the blue, any off the cuff recipes I make normally end in disaster. A future career as an alcoholic cookbook author await, naturally. The fact that this recipe also happened to taste delicious whilst using items that I already had in my fridge / cupboards only made me feel more smug that for this bad boy dinner, I had only to rely on myself. This then, is my macaroni mini meatball bake, and it’s perfect comfort food, with the spicy tomato sauce loaded with meatballs and covered in the melted, gooey cheese that’s turned gloriously crunchy around the edges. I don’t like to blow my own horn, but toot toot. Thank you, Smirnoff, for the inspiration. Combine all meatball ingredients together with your hands. Roll into little balls, line up on a baking tray and grill until cooked through (it took me about 10 mins). Cool on kitchen paper. This is just a basic meatball recipe, feel free to add chopped chilli, onion, spices, basil etc according to your own tastes. Preheat oven to 180 degrees centigrade. Cook the onion, garlic and chilli in a saucepan over a medium heat until soft. Add the tomatoes, bring to the boil. Add the tomato purée, balsamic vinegar, oregano, Tobasco, Worcestershire sauce, and sugar. Add a third of the stock, simmer for 10-15 minutes. If after this it looks too thick, add some more stock. You don’t want it too thick as the macaroni will need a small amount of moisture once in the oven, but you also don’t want a watery sauce, so add the stock little by little until you’re happy with the sauces thickness and consistency. Season. Cook 250g macaroni for approx 4-5 minutes less than the packet cooking time. Drain, then stir into the tomato sauce. Add the meatballs, stir again and transfer to a square dish (something that you’d make a lasagna for two in). 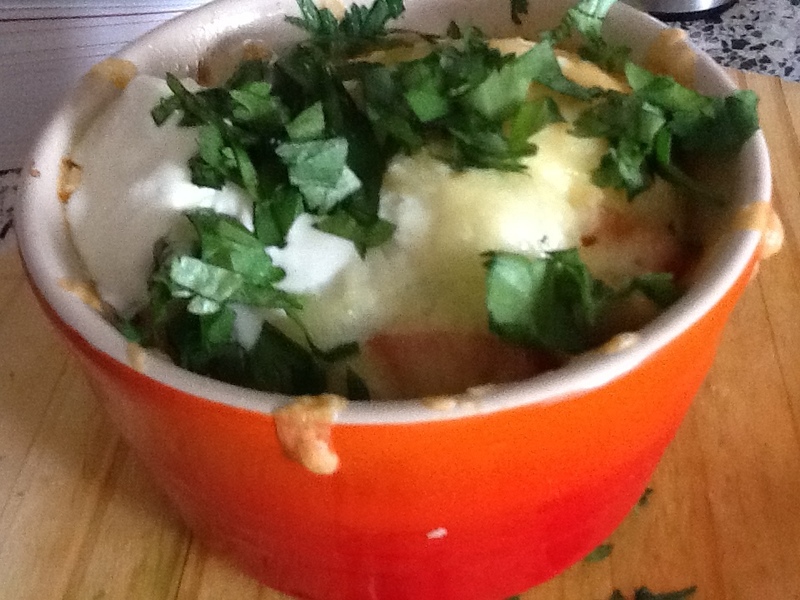 Cover liberally in your grated cheeses and bake in the oven for 20-30 minutes. Serves 2-3 people (leftovers taste great reheated the next day too). Aside from chocolate, there is only one other food on the planet above all others that comforts, satisfies and that I find incredibly hard to stop eating. Pasta. 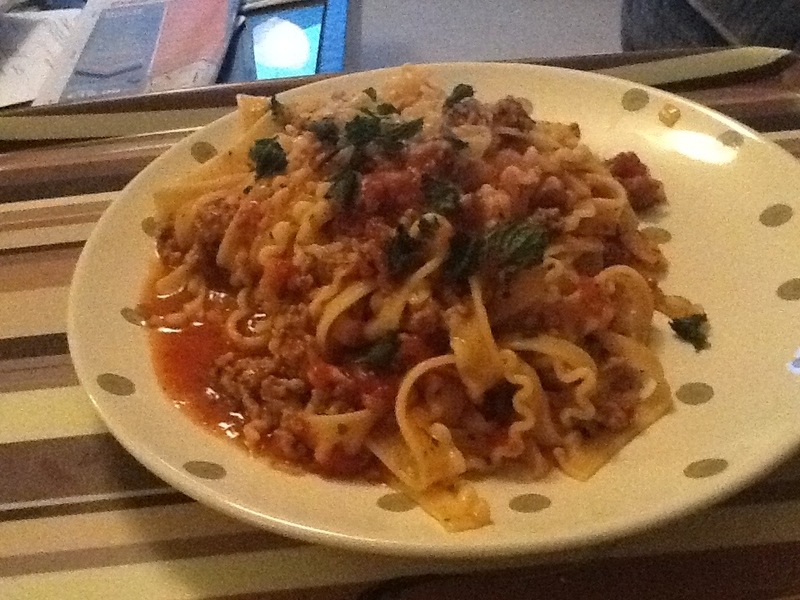 Spaghetti, tagliatelle, linguine, lasagna, fusilli, pappardelle (my favourite)…. I love it all and in practically all it’s formats. The one thing I don’t love about it is its inflexibility and refusal to be cooked in anything other than a saucepan full of hot boiling water. A problem when you have no hob. Stood in the pasta aisle the other week carefully studying every pasta packets cooking instructions willing them to be microwaveable, I nearly had a nervous breakdown. How was I going to have my regular fix of lasagna, bolognese, lamb ragu, chilli linguine, meatballs and pasta? In desperation and in need of pasta, I turned to Tesco’s ready meal section which at the time was risky and foolhardy being right in the middle of Horsegate. Pasta addicts will understand that when you need a carby Italian hit you’ll go to any length to get it. Suffice to say, it was an underwhelming experience and just cranked up my proper pasta craving to maximum. Sure, you can go out to a perfectly lovely Italian restaurant and have a delicious plate of cannelloni , but nothing beats a big, diet busting plate of your favourite lasagna in front of the TV on a chilly night. It’s the best kind of comfort food. So thank Pasta God (I like to imagine Her as Sofia Loren who once said about her body “everything you see I owe to spaghetti”. My kind of woman) for Pinterest and its glorious search function which led me to a slow cooker pasta dish that sounded right up my street: slow cooker chipotle chicken tortellini. Not very Italian I know, but I jumped at the chance to cook it. All you have to do is poach the chicken in some stock (this takes about 3 hrs in the slow cooker), shred it once cooked then add cream cheese, chipotle paste, broccoli and cumin and cook for another couple of hours. Simple! Chipotle paste is now fairly easy to come across in the more exotic supermarket aisles and is made up of smoked chillies and some other stuff. Not sure what exactly, but it tastes spicy, smoky and makes me think of Mexico and the Deep South of America. I used the most Southern looking tortellini I could find in the, er, Italian aisle and that came to be sausage and ham. It worked damn fine actually. While I’d have preferred the sauce a little thicker, it was still creamy and smooth with a hot kick from the chipotle. The only problem I had was the broccoli was totally inedible from being in the slow cooker for two hours, next time I’d only put it in for about half hour as that’s really all it needs. But still, I’ve finally found a way to cook pasta at home. Now if anyone knows how I can cook spaghetti in a slow cooker please tell me, I’m desperate for a bolognese hit! What must people think of me?! Well it turns out I have a reputation when it comes to food. And apparently it’s not good. Yes, someone at work dared to write down their opinions on fellow workmates and it wasn’t all flattering! I’ll mention no names but they know who they are. Luckily for her, we are a very good humoured bunch and found it hilarious. My reputation apparently is that I don’t share food, and don’t you dare criticise my cupcakes! Now, this could possibly have to do with the fact that on my 2nd week in the job many years ago (two), I may have gone out for a few drinks with my new workmates and while eating a kebab at the end of the night, shouted out in true Joey Tribiani style “Hayley doesn’t share food”. (That’s me in case you hadn’t twigged). And they have never forgotten it. Despite the fact I regularly bring in cupcakes for all to tuck into. I must confess, I have at times been a little overprotective with my food, even The Boyfriend couldn’t get a look in, but I’ve changed, I’m a new woman! But yeah, she’s spot on with one thing: don’t criticise my cupcakes biatch. Let’s move on from questionable reputations and discuss dinner. Tonight I delved into my Delicious magazine from May 2010 which is an Italian special and full of pretty gorgeous looking recipes. I really love Italian food, but haven’t experimented much with the country’s cuisine, sticking to fairly safe and reliable dishes. And I’m sorry to say that I’ve done that again today. I needed a quick, easy dish after work and the gym, and this fitted the bill. It’s tagliatelle with prawns, chilli and courgette (catchy title), and takes 15 minutes from start to finish. While the dish was nice and easy, (and courgette free due to a lack of them in Sainsbury’s- I replaced them with a carrot) it was nothing special. Sauce was creamy and smooth, with a hint of garlic and a kick of chilli, while the actual tagliatelle may have been the best thing. I really love eating pasta, I don’t know what it is about it but I find the stuff so comforting even when it’s straight out of salted water, completely plain. Could be the many Saturdays in with the parents as a child watching Gladiators and eating homemade spaghetti bolognese. Food associated with comfort and happiness will always be our go to favourites after all. But I should definitely branch out and try more obscure or unusual pasta dishes, and not stick to the easy, comforting meals. If someone, say, oh I don’t know, a celebrity chef well known for food crusades, tells you that you, yes you can cook a 3 course meal in no more than 30 minutes, it is indeed too good to be true. Jamie Oliver I’m talking about you. In case you hadn’t guessed, todays recipe comes from Jamie Oliver’s 30 Minute Meals book, and while there are many lovely looking recipes within its pages, they are quite frankly unachievable in such a short space of time. I’m not just saying this after trying one recipe that took ages, I’m saying this as someone who’s cooked many meals from here that have taken a lot longer than half hour. I’ve even teamed up with The Boyfriend in the past to lighten the load and speed things up, but this still took 90 minutes. Why the rush anyway to cook dinner? 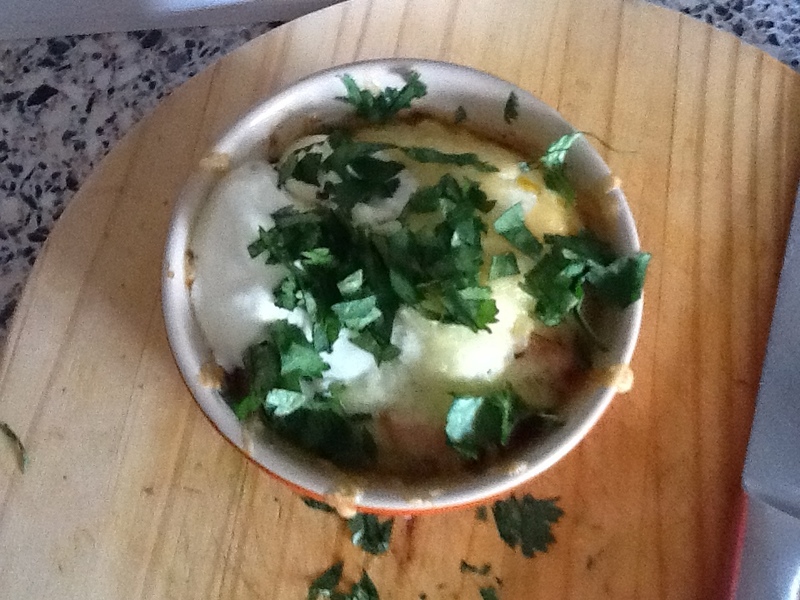 If I want a quick meal when in a rush I take some leftover chilli out the freezer or pop a pizza in the oven. If I’m not in a rush, that’s what all the cookbooks are for. At the end of the day, cooking should be enjoyable and if I rush around in the kitchen I get stressed, overheated and am likely to accidentally stab someone while flapping about in a panic. Just take your time. Saying all this, all the recipes I’ve tried from this book have been delicious and if you can forget Jamie’s false promises and just cook at your own pace then you’ll have a lovely dinner. 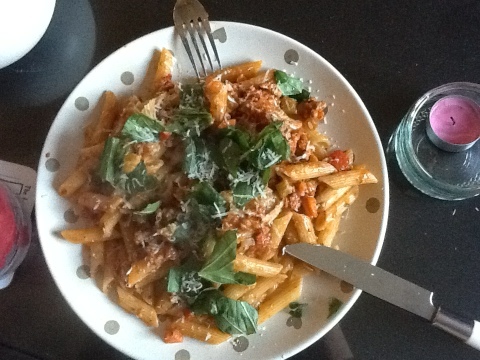 Today I cooked Pregnant Jools Pasta, which I’m guessing from the name means his wife ate this a lot while preggers. 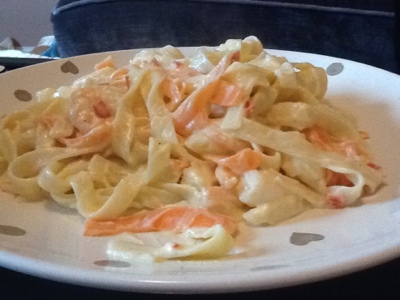 I am not pregnant, but agree with Jools that its a tasty pasta dish. Now, the whole meal plan in the book also includes a salad and then some little frangipane tarts but I just wanted the pasta, which meant for the first time ever a dish from this book really only did take half hour. The pasta sauce is made with veg, herbs, spices and sausages that have been de-cased and mashed up so you have something resembling a bolognese sauce. It has a nice aniseed flavour from the fennel seeds as well as some strong balsamic notes. I used low fat pork sausages with a high meat content from Waitrose which made me feel a little bit more virtuous until I grated tons of Parmesan cheese over it. I’m guessing the taste of the dish would vary depending on what sausage you use, but these went very well with all the other ingredients so I recommend. Other great recipes in this book include Satay Chicken Skewers (very addictive), cheesy grilled mushrooms (part of the steak sandwich meal plan, but this is a very rare occasion where the vegetable is more desirable than the meat) and piri piri chicken. Despite my reservations over the time frame, it’s a decent cook book, but don’t put yourself under any pressure to get the whole meal done in 30 minutes. You’re human, not Superman/Jamie Oliver after all. PS: if it looks like I had a lot of pasta on my plate, well that’s because I did. Hunger struck!